Always wanted to learn Dutch? Want to make the most of your study abroad experience in Amsterdam? Now you have the ability to do so! Each semester ISN Amsterdam organizes Dutch lessons at a discounted price in collaboration with Taalhuis Amsterdam. We offer two types of courses: either for 6 or 12 weeks. Both courses start in the week of the 11th of February. If you choose to participate for 6 weeks, you will finish just before exams. With 6 weeks, you will end up halfway through Dutch Level A1, so it’s really the basics. If you choose to participate 12 weeks, you will have 6 weeks of classes, a one week break during exams and then you will continue with the final 6 weeks of classes. With the 12 week-course, you will have (around) Dutch Level A1 (you can ask Taalhuis Amsterdam for a certificate). However, by that time you are only halfway through the book (included in the price), meaning you will have level A2 when you finish the book! Classes will start in the week of the 11th of February. The exact location for your classes will be communicated to you by Taalhuis Amsterdam once you are enrolled. 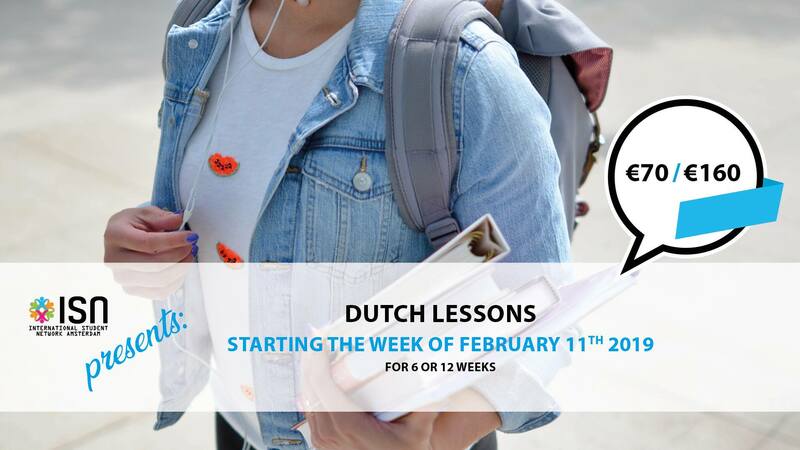 Sales for our Dutch lessons start on Monday the 4th of February! Come by our office at Crea (room 1.15) to register! We are open every Monday, Wednesday, and Friday from 13:00h to 17:00h. See you there!